To enjoy a unique driving experience it is important to be safe behind the wheel. The new Jeep® Renegade is designed to provide more than 60 available safety and security features, including segment-first availability Forward Collision Warning and LaneSense™ Departure Warning-Plus. The new Jeep® Renegade has been awarded with the prestigious 5-star rating Euro NCAP with an overall rating of 80 out of 100. Euro NCAP has increased the thresholds to obtain the coveted 5-star rating regarding adult, child and pedestrian safety. The Jeep® Renegade’s innovative “small-wide 4×4 architecture” and numerous safety systems, offered as standard or on request, including six standard airbags have contributed in earning this award. another vehicle or large obstacle in its path too rapidly and warns or assists you in avoiding/mitigating the incident. Predictive Collision Warning: providing audible and visible alerts as well as a brake jerk to warn that the vehicle is approaching an obstacle in its path. Advanced Brake Assist: if the driver is reacting but not braking enough, ABA will increase the braking pressure to avoid/mitigate the accident. Collision Mitigation System: if the driver doesn’t react the system will activate the brake system to avoid/mitigate the collision. With Jeep® Renegade you always go in the right direction. The vehicle lane position is monitored by cameras. If the vehicle approaches the lane boundaries unintentionally, the system will assist the driver with visual and audible warnings. Additionally, in case of lane drift detection the system proactively leverages the electronic power steering to deliver a torque-input to assist the driver with a corrective action.With Jeep® Renegade you always go in the right direction. The vehicle lane position is monitored by cameras. If the vehicle approaches the lane boundaries unintentionally, the system will assist the driver with visual and audible warnings. Additionally, in case of lane drift detection the system proactively leverages the electronic power steering to deliver a torque-input to assist the driver with a corrective action. helps you maintain the right safety distance. When a side or rear blind spot is met, you are notified via illuminated icons on the side view mirrors or an audible chime. Expand your field of vision. 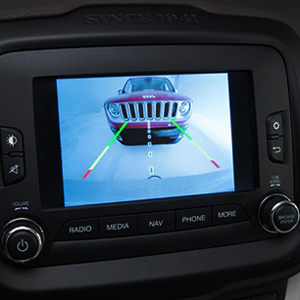 With the ParkView rear back-up camera you’ll have perfect visibility when reversing and movement and direction guidance thanks to Dynamic Lines. The new Renegade is developed entirely with your safety in mind, even the key. When you’ll enter the vehicle, an electronic sensor will detect if the key fob is with you and allows you to start the vehicle by simply pressing the Start&Stop button. In addition, a transponder is embedded in the engine that will recognize your personal car key. If an incorrect key is detected the engine will shut off after a few seconds. Renegade helps you get the best out of any driving situation and includes various pure Jeep® DNA safety features, like Hill Start Assist (HSA) to easily descend steep grades or Hill Descent Control to start a vehicle on a hill and with the Tire-pressure monitoring (TPM) system that informs you when the tire pressure is too low. Furthermore, thanks to the Mopar® Electronic Vehicle Tracking System you’ll have a state-of-the-art GPS-enabled stolen vehicle recovery system with nationwide tracking including 24/7 emergency service dispatch, security fence, arrival/departure notification and excessive speed notification.